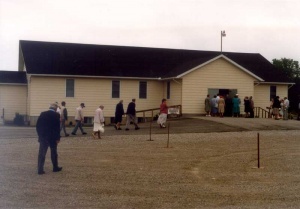 The Aylmer Old Colony Mennonite Church in 1989. Old Colony Mennonites from Mexico began immigrating to the Aylmer, Ontario area, near Waterloo, in 1954. 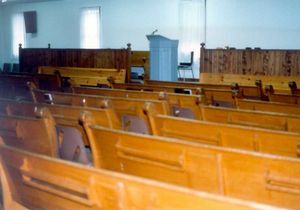 Services were organized in 1957 by Aeltester Jakob J. Froese from Winkler, Manitoba, who also organized the Old Colony Mennonite Church (Alt-Kolonie Mennonitengemeinde) in Aylmer. Various ministers visited the congregation for several years until elections were held in 1960. At that time, Heinrich Reimer, Johann Neufeld, and Cornelius Quiring were elected to serve the western part of the church, and Jakob Reimer, Wilhelm Fehr, and Jakob Giesbrecht were elected to serve the eastern part. Heinrich Reimer was elected as Aeltester on 19 November 1972. After Reimer moved to Seminole, Texas, he was replaced by Cornelius Quiring on 18 November 1978. He served until 1983, when he left to establish the New Reinland Gemeinde. Wilhelm Fehr was elected as Aeltester on 8 November 1984 and served until his death in 1989. He was succeeded by Cornelius R. Enns, elected on 11 November 1989. In 2010 the bishop responsible for the congregation was Herman Bergen. Services were held in both Low German and High German and the congregation had 500-600 members. Dyck, Peter and Henry Friesen. "Old Colony Mennonite Church of Ontario" in Old Colony Mennonites in Canada 1875 to 2000, edited by Delbert F. Plett. Steinbach, MB: Crossway Publications, Inc., 2001: 163-167. Gutsche, Horst W. "Verzeichnis deutschsprachiger Gemeinden und Seelsorger in Kanada." March 2010. Web. 23 February 2012. http://www.uwinnipeg.ca/index/cms-filesystem-action/pdfs/german-cdn/101217-1.pdf. Mennonite Reporter 15 (21 January 1985): 5. Thiessen, Richard D. "Old Colony Mennonite Church (Aylmer, Ontario, Canada)." Global Anabaptist Mennonite Encyclopedia Online. February 2012. Web. 20 Apr 2019. http://gameo.org/index.php?title=Old_Colony_Mennonite_Church_(Aylmer,_Ontario,_Canada)&oldid=142060. Thiessen, Richard D. (February 2012). Old Colony Mennonite Church (Aylmer, Ontario, Canada). Global Anabaptist Mennonite Encyclopedia Online. Retrieved 20 April 2019, from http://gameo.org/index.php?title=Old_Colony_Mennonite_Church_(Aylmer,_Ontario,_Canada)&oldid=142060. This page was last modified on 1 January 2017, at 21:39.